What are the steps that a professional upholsterer should go through to make sure that the job runs smoothly through the shop? These would probably vary widely from shop to shop. Below is a list that I am making for my own use to help me keep organized. Perhaps it may give you some ideas about how to organize your own process. To save time and frustration for both us and the potential client that we sometimes start by giving a rough phone quote. If the client is acceptable to our rough phone quote or rough estimate then we give a full detailed estimate to the client (and keep a copy.) For more information,see Giving Detailed Estimates. Clients can choose fabric from the samples in our store or from the fabric samples linked to our website. If a client chooses a fabric from the website we will either recommend that the client order a swatch or the fabric, or we will order it for them. We will not order the fabric for them until after they have seen an actual sample of the fabric. After client chooses a fabric, call the wholesale fabric company and check the current retail price and check current stock. (Some fabric supplies will allow you to log into their website and check the current price and how many yards they have in stock) If possible, do that immediately while the client is still in your shop. If you are doing an in-home estimate, call the fabric supplier to check stock and price while you are still in the client's home. If that isn't possible, do it promptly that day or the following day. If a client wants to purchase their own fabric I strongly recommend that they first let us give them an estimate, which shows both the total cost using our fabric and using their fabric. Our estimate form automatically figures into the price a COM fee of $15 per yard. 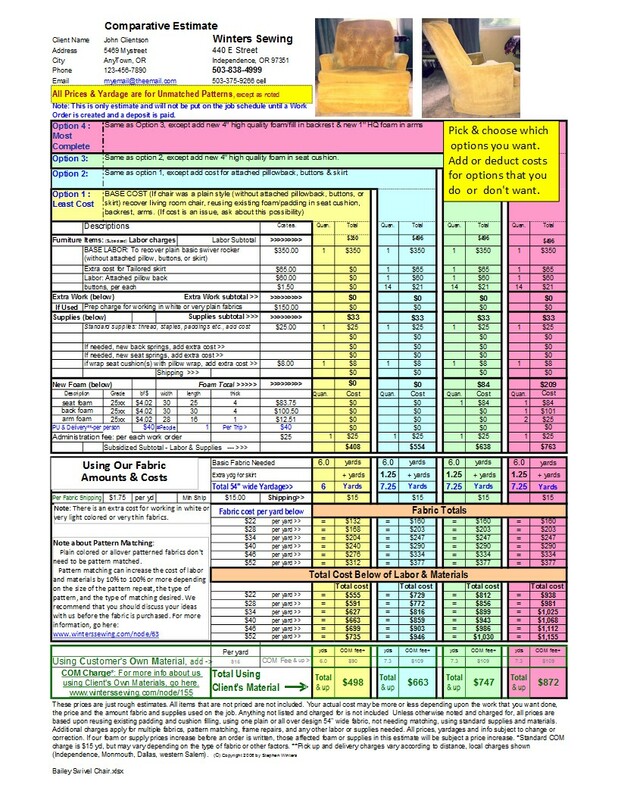 On this page is a sample of our estimate form, which gives various price options. From that page, click on the estimate form, then click again to enlarge it. You will notice that the price for C.O.M. fabric is at the bottom of the form. On the estimate I also have a link to our COM page where it explains the COM fee. There are several ways to write up a Work Order. In Recent years I have been using the invoice function of QuickBooks to create my work orders. I very seldom use the preprinted paper work orders any more. You can see an example of my QuickBooks work order at the right. Click on the picture to see a pop-up window with a much larger view of it. In the busy day and age most of client's don't want to hang around while I write up the work order. So I offer to email the Work Order to them, and most of them jump at the chance rather than waiting around for me to finish it. I've created the Work Order and have attached it to this email as a pdf file. Please look it over and make sure everything is as you wanted it. Also, check the fabric sample below and verify that is the correct fabric. return it to us with a 1/2 deposit. Once we receive the Work Order and deposit we will put your furniture on the Work Schedule to start after we have worked through all the jobs in front of your job. (We are booked out quite a few months). We will also order any orderable materials that might be listed on your Work Order. When we have all your materials in our shop and when we are ready for your furniture we will notify you. Looking forward to working with you. Feel free call or email us if you have any questions. Much of the time I also go to othe fabric company website and find the fabric, copy a picture of the fabric which also shows the Pattern and color name. I paste that into the above email before I send it out. Keep a running list of the supplies needed. Add new items to the list as we think of them. Once the client has chosen a fabric, if they chose a fabric from one of our sample books. Put fabric samples aside in a chosen place until the fabric comes in. Always make out a purchase order, which includes the wholesale prices. While the client is at your shop OR while you are at the client's home, call the upholstery supplier to check stock and check the current retail prices. (Your wholesale cost ist generally 1/2 of the retail price. Sometimes the supeplier will give you the wholesale price. make sure you clarify with them whether they are giving you the retail or wholesale price. Sometimes the wholesale supplier may make a mistake on the price list or the web page , which you probably wouldn't catch if you didn't have the price on the Purchase Order. The Purchase Order also will remind you of what you ordered. Quickbooks has Purchase Orders built into it, which is what we use. If you do not have Quickboods or another software, buy a pad of purchase orders from an office supply store. Keep the ordered fabric sample in a safe place until the fabric comes it. That will make it much easier to check the fabric against the sample when it arrives. Once the client has chosen her fabric, use a thread color chart to match the chosen fabric. Check to see if we have enough of that thread. If not, put the thread on the supplies order sheet. Pattern and Color is the same as what the client ordered: Compare the color and pattern names on both fabric sample and on client's work order. Color dye lot is close: hold fabric on roll against the color swatch in the sample book. If you see any flaws, put a marker (ribbon, tape, yarn) on the selvage edge of the fabric that can be easily seen. Measure how far up and how far from the edge each flaw is located. Put this info with your job notes. Write a note about the date you verified the fabric. If the fabric is unacceptable for any reason, contact the supplier immediately to start the process of returning the fabric. Write a dated note on the back of the work order or on job notes or in the computer that you checked in the fabric and the results. Read your previous notes about the fabric. If you have not previously checked the fabric, roll out the fabric and inspect it now. determine useable length and width.